::Seth Lakeman, Edinburgh Liquid Rooms, 27th February, 2007.
::The Sounds/Shiny Toy Guns, live Edinburgh Cabaret Voltaire 16th February, 2007.
::Half Man Half Biscuit, Edinburgh Liquid Rooms, Wednesday 15th November, 2006.
::The Twilight Singers, Edinburgh Cabaret Voltaire, Sunday 27th August, 2006.
::The Editors/The Dears, Edinburgh Corn Exchange, Monday 21st August, 2006.
::Michael Franti and Spearhead/Xavier Rudd, Edinburgh Corn Exchange 16.8.06. "(the programme) will also continue previous government initiatives, such as cash handouts given on condition that children are sent to schools where they get free meals." Free school meals are part of new Brazilian President Lula's anti-poverty program. So we can't afford free school meals here in wealthy first world Scotland, yet they are being introduced in poverty stricken Brazil. Maybe the Scots need their own Lula. Accepting that his proposals were controversial, the asylum seekers leader said: "The message to the Conservative terrorist must be this: stay at home or you will be sent back to America." This answers my question about the Business Party, another new rightist party who sought to "remove ideology from politics" and replace it with pure greed presumably. They never got off the ground and won't be contesting Holyrood. Losers. Margo McDonald, SNP left-winger is to stand in the lothians as an independent. The article does not make clear whether this is in the first past the post seat, or on the list section of the vote. Margo is a popular and effective politician who could certainly take a few votes, primarily from the SNP. At the same time she could also damage SSP attempts to get someone elected on the list section in the Lothians. A new blog seeking to be a balanced news filter for the Scottish Parliament elections in May. Nice looking site, hope it lives up to its potential. Make your own propaganda posters. long live bananas, down with post-modernism, that kind of thing. Another new party under discussion. The BBC reckon that a fishermans party could gain up to 3 seats on the party lists system. I reckon this would hit the SNP hardest. All this and Tommy Sheridan has a column too. "The Internet played a very significant role," said Sarah Sloan, an organizer with International ANSWER, the group that planned the rallies. "It made a major difference in getting our message out there, especially because the mainstream media isn't covering the anti-war movement." Sloan said for many people, joining the movement was as simple as typing "anti-war" into Google and being directed to hundreds of anti-war websites. I previously wrote about the New Britain Party who seemed to be posing as being to the left of the Tories (slightly). They have yet to announce their policies, so it is hard to say whether this story is a stitch-up or not, but the real Tories have branded them as fascists. Maybe they are scared of losing yet more votes, or maybe they have inside knowledge of these Tory renegades that we don't have. TOMMY Sheridan yesterday predicted his Scottish Socialist Party could benefit from the tide of anti-war feeling in May?s Holyrood elections. This week saw the announcement of a new party who intend to fight the Scottish parliamentary elections in May 2003. The New Party for Britain is a centre-right group, slightly to the left of IDS and his hopeless Tory Party and maybe slightly to the right of New Labour. Describing themselves as 'progressive conservatives' (is Tony Blair a 'conservative progressive', nah just a conservative.) they haven't even settled on a final name for their party. But hey, it's not as easy as you might think. I will from hereon refer to them as the newbies. An alternative view of the newbies motivations can be found at this satirical site. They are not the first to try to launch a new party covering that ideological ground. Last year we heard about the launch of a Business Party in Scotland, it's leader even debated with Tommy Sheridan on TV. But it was never heard of again. What these initiatives represent are firstly the crisis in the Tory Party, particularly in Scotland, and secondly the new opportunities in Scottish politics. The newbies are funded by a Scottish millionaire disillusioned with the shambles of the Scottish Tory Party. They have continually sunk in the polls. Ever since their '97 wipeout, when they returned no MP's from Scotland to Westminster, the smell of failure has hung over the Scottish Tories. Polls indicate that their voters are settling in nicely with the liberal democrats, and no doubt many are quite happy with New Labour. It will be tough going for the newbies, UKIP or the extreme right to take any serious votes from the historic party of the ruling class. Which is why they are looking to the Scottish elections. The PR section of the vote actually gives small parties a better chance to get seats. The SSP have dramatically climbed in the polls over the last four years. This months herald poll gives us 7%, equivalent to 5 MSP's. The system has rewarded parties like the SSP and Greens who actually provide a political alternative to the free-market consensus that prevails amongst Labour, the SNP (whose major new policy is cutting business rates), Lib-Dems and Tories. Why should anyone vote for more of the same from the newbies? and this lot are pretty good too. a couple of free mp3 downloads from these syracuse, New York political punk rockers. a language other than the scream of rocket-burn. elections, money, empire, oil and Dad. 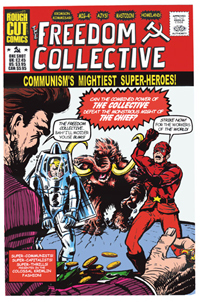 The Freedom Collective - Communism's Mightiest Superheroes. A one-shot title which imagines what if the two giants of American comics had been born not in America, but in Russia instead. Produced by Scots it seems. This site is now a member of the Scottish Blogs webring. See the link above for more Scottish blogs.